Unfortunately there were two problems with 100 miles in the alps; the first was “100 miles” and the second was “in the alps”. It did not take us long to identify that our average pace was going to turn this into an overnight ride with a descent from Galibier at midnight. Naive and ignorant. Thankfully we put aside the silliness and realised that climbing Col de la Croix de Fer would itself be an achievement and turning round at the top would not be a failure. Looking at the map we could see our planned route easily but we had no idea what was actually around each corner until we got there. We hadn’t looked at an elevation profile either so had no idea that we’d be undulating either. A cafe appeared out of the clouds and there were cyclists sitting drinking and eating in the first signs of sunlight and warmth! We were so glad we hadn’t pulled into a cold damp layby and instead could enjoy a morning drink. The Patisserie van pulled up and I ordered an espresso and asked if there was any pain au chocolat, however the only pain au chocolat was in the hand of the cafe owner and although she offered it to me I couldn’t take her breakfast from her. The clouds were melting away and we began to see where we were, right up in the mountains already, Suzanne and I were delighted to have climbed so far in one go and find a charming cafe. We spent a nice 30 minutes chatting to the guys at the next table, who were from Nottingham and on their annual group ride. Their plans were to head over Croix de Fer and down to Saint Jean de Maurienne before climbing Col du Télégraphe and finishing their day in Valloire. The next day they had Galibier planned and a finish in Bourg d’Oisans. It is nice to report that on the following day I bumped into them again in Bourg d’Oisans having successfully completed their route; they were drinking coffee in the afternoon and contemplating adding Alpe d’Huez to the list of scalps they had taken. Suzanne and I set off again into the bright warm sunshine and climbed a little out of this town, le Rivier d’Allemont, shortly we found a significant series of hairpins dropping away below us. Although we’d reached 1254m at the cafe, we then lost a good 250m descending to a bridge and had to regain this height climbing again. This next section of the climb was the hardest as the gradient was much steeper than anything else so far that morning. Here Suzanne had a tiny moment of doubt, but she knew that if we turned round now the ride was over. We kept going. This was a point at which we both felt so humbled by where we were. The mountains kept towering above us, now matter how high we cycled they kept being piled on top of each other and you had to look up to really see the scenery. Throughout the morning we had been talking whilst riding and much of the conversation had been about love, forgiveness, responsibility and faith. Surrounded by these mountains we also said a prayer of thanks to God. There was no question of doing this ride in one go for us. We’d be happy to claim to have reached the top, we were not trying to claim a time; so we stopped in a lay-by for the obligatory self-photographic “head-shot”. It is difficult to find more ways to write about cycling uphill and the wonderful surroundings and I’m falling back on the pictures I took. Pictures which honestly don’t do the place justice. This was an immersive, surround-sound, 3D, 4D, double-D, wrap-around, whole body, holistic experience. You just had to be there. And I was missing my wife. I would have loved to have Carol with me and she wouldn’t have found the roads as difficult as she might imagine and I think the kids could have managed it too, although they aren’t as keen cyclists as Carol and I. There were lots of cyclists of all nationalities on the road. In the distance we could make out the top and all we had to do was pull our tired bodies up the last section of the climb. And finally… we made it! What a wonderful experience, it took such a long time to ascend to the 2067m pass but it wasn’t actually difficult, it was just a long hard ride which required fitness instead of strength. We celebrated with photographs at the top, beer and an omelette with ham and cheese – and also some fries! The cafe filled with other cyclists sharing hero stories and comparing ascent times! Possibly the most expensive place to eat at the top of the pass, but not much choice – the food was good though, as was the beer. And then it was time to descend. It really didn’t take us long! Perhaps about 1 hour from leaving the top to arriving in Allemont for a beer. Sweeping round yet another hairpin. This report is dedicated to you Suzanne – you climbed so well and reached the top. 2067m above sea level; Col de la Croix de Fer! 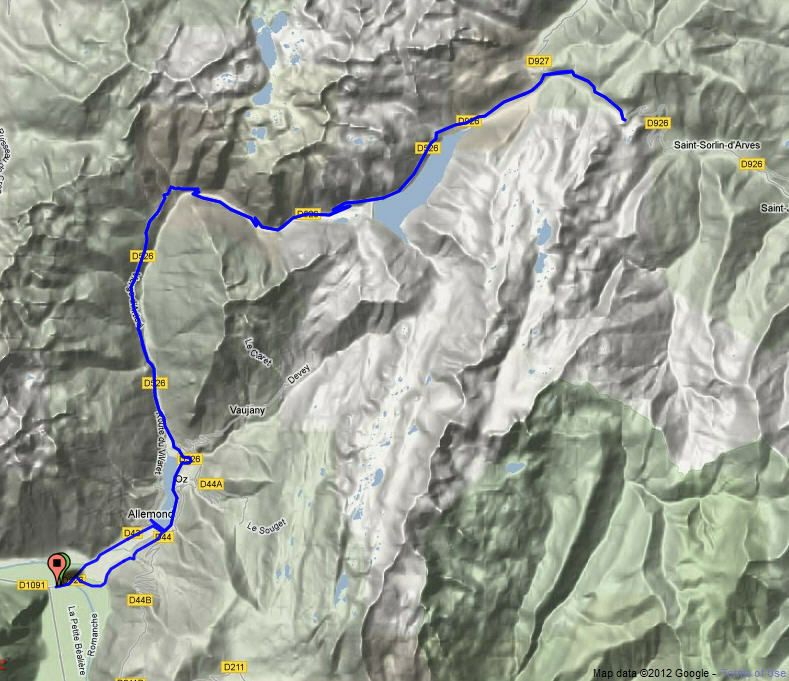 The Tour riders will be coming over Col du Glandon this year (2012) and doing the last section of the climb we did. Well done.